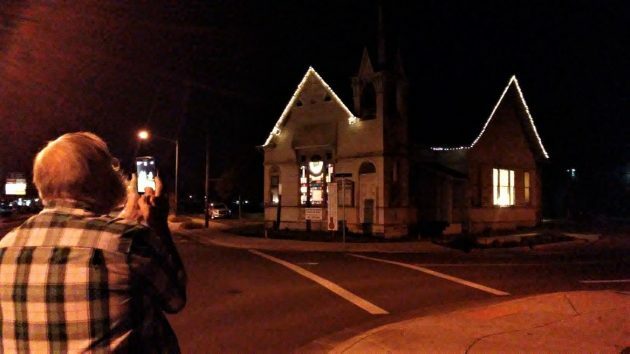 Councilman Ray Kopczynski gets a shot of the Cumberland Church on Monday night. The council majority has balked at spending public money on a proposal to move the former church building to a city-owned lot near Hackleman Park and then getting it refurbished as a community center. A group of private citizens, first organized as the Willamette River East Neighborhood, stepped in. Now they operate as Save Our Cumberland Association. They’re raising money toward the restoration, hoping to persuade the council to allow moving the structure to the proposed site next to the skate park across the street from Hackleman Park. On Wednesday night the supporters were inside the old church decorating it. 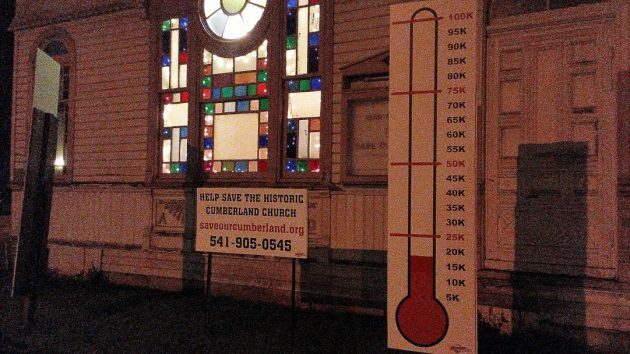 I didn’t know that until I read their website (saveourcumberland.org) when I got home. They were getting the building ready for the Christmas Parlor Tour on Sunday. The original part of the building dates from 1892. The idea of moving it is based on the shortage of parking on its present site at the corner of Main Street and Santiam Road. But there’s plenty of parking on nearby streets plus, after-hours, there’s off-street parking across Santiam, and within walking distance at the ESD. Projects that catch the spirit of private voluntary association and volunteerism are inspirational. It is always good to see private people freely spending their time and money. Free association and volunteerism need to be applauded every time it happens. Hopefully this good vibration will not be tainted by diverting money from public safety, education, parks, and the library into the building. The church is not a higher priority than essential services. Nor should CARA force every property taxpayer in the county into an involuntary association with the neighborhood group. If this church is to be given new life, let it be a self-sufficient asset, not a financial burden, on taxpayers. Re-build the church the right way – without taxpayer money. Why don’t you prove your concern Gordon and buy it? Because you HATE government and all it does. One wonders if Mr. Kopczynski admonished the City Council work session to make the journey over to the church while the Work Session was still in-order. If so, might that admonishment not be seen as a violation of church-state separation. He didn’t admonish anybody. And anyway, that city-owned building is called a church because it was built and for many years used as one. Now it’s just a building owned by the city. Thank you for your pictures and comments Hasso. . . Would have included lighting the steeple but it is just too fragile. . . Wish you had been able to stop in for the decorating. It was great fun! About 50 volunteers did an amazing job to prepare it for the Christmas Parlor Tour on Sunday! . . . Just a shout out to Pacific Power and Light who came to our rescue and used a bucket truck to get those lights up there! Seems like people and companies from everywhere are getting involved!